"...this is a book that is a great inspiration to me in my work, and I look upon it as one of the classics for all professional or amateur students of architecture and community building, regardless of their age and background, or how short or long their experience may be." Ralph Erskine, from the foreword to "Life Between Buildings"
"The partners of pedestrian life he has observed and the recommendations he has made are highly applicable to American cities...A splendid piece of work." "This book will have a lasting influence on the future quality of public open spaces. By helping us better understand the large public life of cities, Life Between Buildings can move us toward more lively and healthy public places. Buy this book, find a comfortable place to sit in a public park or plaza, begin reading, look around. You will be surprised at how you will start to see (and design) the world differently." 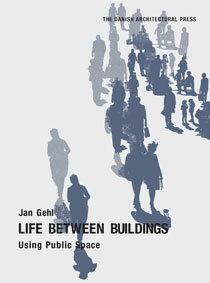 "This book should mark a milestone for studies of the way people attribute meaning to and use public spaces in many countries. Owning it is a must for environmental design teachers and practitioners."